Whether you are living in the small apartment or big apartment or any big size or small size home. You will love to decorate every place for the Christmas. Because Christmas is a big festival and peoples from all around the world celebrate this festival. Every country has their own traditions for the Christmas decoration. As you have to decorate the complete home, so you must have to start the decoration early to complete everything within the time. But before you start the decoration you will definitely love to look some Christmas decoration for home inspiration, which can give you an idea for each and every place which you want to decorate. A DIY Projects makes a beautiful collection of Christmas decoration for home and you will definitely love to try some of the ideas. The best part of this post that you will not only get the ideas, but you will also get some stunning DIY Christmas decoration for the home with tutorials in this collection. Choosing the do it yourself decoration will give an opportunity to spend some quality time with your family and it will definitely help you to save some money. You can involve your kids and family member while making the DIY decoration. If you like any DIY Christmas decoration for the home listed in this post and wanted to learn how you can make it. Just follow the tutorial at the end of each description. Scroll down below check all the decorating ideas and choose the best one for your home. These ideas will definitely help you give a beautiful look to your home for this Christmas. A beautifully decorated star along with bottles candle holders will give a stunning cozy look to the bathroom. Take fresh tree branches to make a natural Christmas tree. You can keep this decoration as long as you want, you just have to light up the candles or once they finish, just change them. Are you living in the rustic bedroom? Then you will definitely love to choose a rustic theme for the bedroom decoration during this Christmas. These two rustic Christmas tree made from the dried tree branches will give a stunning look when you keep them at both ends of the head side of the bed. Hang few small wreath, star and heart ornament on the wall for a perfect display. Colors always play very important role in the Christmas decoration. There are so many different color theme which peoples love to choose for the decoration. But if you want to try something unique and beautiful this Christmas. Then this stunning blue Christmas decoration can be a perfect choice for you. The blue glass ornaments hanging on the natural Christmas tree looking very beautiful. You can also keep other things shown in the picture. More Blue Christmas Decoration references from the Internet. This beautiful decoration made for the dried tree branches will give a beautiful look to the Christmas decoration. You can place this Christmas tree in the living room, bedroom or any other places where you want. A beautiful big size black color star on the wall will give a stunning look to this decoration. Don’t forget to hang different types of ornaments on the tree branches. More Branches Christmas Decoration inspiration from the Internet. You might have tried so many types of candy canes Christmas decoration in the previous year. But have you ever tried to make a big size candy canes decoration for the outdoor? This big size candy canes decoration will definitely give stunning look to your outdoor Christmas decoration. The glowing lights will add an extra beauty to this decoration during the night. More Candy Canes Christmas Decoration inspiration from the internet you love to follow. A centerpiece is a most important part of the Christmas decoration. Your dinner table can not be look completed without having a beautiful centerpiece on the table. This centerpiece can also be used on the living room table. Beautifully decorated red and green color ornaments with candy canes will give a perfect display to this Centerpiece. More Christmas Centerpieces Decoration inspiration from the Internet. We all love to hand the wreath on the frond door, over the windows, over the fire place during the Christmas. There are so many themes which we can choose for the wreath decoration. But if you want to decorate your home in a traditional way for this Christmas then there will be no better choice then this pinecone wreath. This wreath will definitely give a perfect traditional look to your Christmas decoration. More Christmas Pinecone Wreath decorating inspiration from the Internet. Are you thinking to invite your relatives for the dinner on the Christmas Eve? Then you must have to give some time to the table decoration. Because this is a place where your guest going to gather and you will definitely love to decorate the dinner table in beautiful theme. This Christmas table decoration shown in the below picture can be a perfect idea. The red and white color theme will give a traditional look to this decoration. More Christmas Table Decorating inspirations from the Internet. If you are a fan of cozy decoration then you will definitely love the living room decoration idea shown in the picture for this Christmas. A beautiful natural Christmas tree along with few gift boxes around it will give a stunning look to the living room. Make a small white wreath and tie a red ribbon on it and keep it over the fireplace for the perfect display. Don’t forget to hang few white color star on the wall and red color stocking for a beautiful look. More Living Rooms decorating inspirations for the Christmas from the Internet. If you are living in the farmhouse, then you will definitely look for a kind of Christmas decoration theme which can give a real farmhouse display to your home. So if you are looking for a farmhouse Christmas decoration idea then you will definitely love to give a try to the idea shown in the below picture. A beautiful natural Christmas tree with few gift boxes around it will give a real Christmas look. More Farmhouse Christmas Decorating Inspiration from the Internet. The first place noticed by your guest is the front door, especially when they come to your home for the Christmas Eve. So you must have to decorate your front door in the best way. You can make this natural front door Christmas decoration very easily and it will not take much time. But when you have the final look of the decoration then you and your guest will definitely say wow. More Front Doors Christmas Decorating inspirations from the Internet. Garland play very important role in the Christmas decoration. You can use the garlands to decorate the staircase or fireplace or any other places. This beautiful green garland with beautiful small ornaments will give a stunning look to the staircase. Use some big size red stocking and hang them on the staircase. Keep a natural Christmas tree along with some gift boxes for the perfect display. More Garlands Christmas Decorating Inspirations from the Internet. Most of the time you use the glasses to sever the wine to your guest and family member. But have every try to make something very beautiful from the glasses for the Christmas decoration. These beautiful glasses candle holders will definitely give a beautiful look to your Christmas decoration. You can keep these glasses on the dinner table or over the fireplace. More Glasses Christmas Decorating inspirations from the Internet. Kids always wait for the holiday and Christmas is a time when they get a long vacation. So if you want to involve your kind in the Christmas decoration. Then you must have to choose a kind of decoration which they make very easily. This stunning wall Christmas tree is very easy to make and your kids can make it in very quick time. More Kids friendly Christmas Decorating Inspiration from the Internet. A kitchen is a place where the mom spends lot’s of time during the festival, especially festival like Christmas to make very sweet food. So you must have to decorate the kitchen which can give her a feeling of Christmas. This Kitchen Christmas decoration idea is very simple and you do not require to do much work to make. Take a small Christmas tree and hang few white ornaments on it. Don’t forget to cover it with the light garland. More Kitchen Christmas Decorating Inspiration from the Internet. Red is a most popular traditional theme for the Christmas decoration. So if you want to decorate your home in the traditional way then you will definitely love the decoration idea shown in the below picture. Beautiful big size star will give a perfect display to this decoration. More Red Christmas Decoration Ideas from the internet. A big size star made from the thin wood slates along with a beautifully decorated Christmas tree will give a beautiful look to the porch when you keep this decoration. Use a ribbon and lights garland to give a perfect look to the Christmas tree and hang ice skating shoes on around this decoration. It will give a real rustic look to your Christmas decoration. More Rustic Christmas Decorating inspiration from the Internet. Ornaments are the kind of thing which requires most for the Christmas decoration. You must need to make so different types of ornaments to decorate the home in a perfect way. These salts dough ornaments will definitely help you to give a beautiful look to the Christmas tree and so many other decorations. More inspiration of making Salt Dough Ornaments from the Internet. Sometimes peoples don’t have enough time for the decoration for the Christmas. But that is not means that you can’t make a beautiful decoration. This simple Christmas decoration can give a really stunning look to your home. This decoration is very simple and you can make it in very quick time. It can be a perfect idea for Christmas decoration. If you are living in a small apartment then space is a big issue while choosing the Christmas decoration. So if you are looking for decorating ideas for a small space then you will definitely love to give a try to the idea shown in the picture. A decorated Christmas tree along with the small basket and few gifts boxes around it will give a perfect look. This decoration can be adjusted in very small space. More Christmas decorating inspiration for the Small Spaces from the Internet. Peoples who are living in the duplex apartment have platy of space for the decoration, especially decoration for the festival like Christmas. So if you are living in the duplex apartment then you must have the stair in the home and this is the best place to decorate for the Christmas. This stunning staircase decoration will definitely give stunning look to the Christmas decoration. After seeing the picture, you can understand how simple this decoration. More Stairs Christmas Decorating ideas from the internet. You might have tried so many types of Christmas tree decoration in the previous years. But for this year decoration if you want to try something unique then you will definitely love to give a try to this unique Christmas decoration. To make this decoration, take six long sizes wood stick and arrange them in the shape of Christmas tree. Now take a green garland and round up over the wood stick. Don’t forget to keep some gift boxes around the tree. There are so many small spaces in the home where you need small Christmas decoration. These beautiful vase made from the glass flask can easily adjust at any place and they are really simple to make. When you keep these vases on the dinner table or over the fireplace they will give a stunning look to your Christmas decoration. As we know peoples who live in the small apartment always have an issue with space. So they always choose a kind of decoration for the Christmas which can be fit in small space. So if you are living in the kind of home then you can give a try to this wall Hanging Christmas tree decoration. This decoration will not cover much space and will give a stunning look to your Christmas decoration. Some peoples always want to try the traditional theme for the Christmas decoration. White is a most popular and traditional theme for the Christmas decoration. This stunning white Christmas decoration will give a stunning look to your home. Use some gold and silver color ornaments to hang on the tree. You can also keep some gift boxes and burlap sheet around the tree. Windows are the place in the home which is visible from inside and outside. So you must have to give a stunning look to the windows during the Christmas. If you are looking windows decoration ideas for this Christmas then you can give a try to the decoration shown in the picture. These windows decoration will give a perfect and snowy look to your Christmas decoration. Wine bottles can be used in so many different ways to decorate the home for Christmas. You use them to make the candles holder and many other things. But as you know that lights are the most important part of the Christmas decoration. So you must have to make some lights decoration for this Christmas. This stunning wine bottle Christmas lights decoration will give a beautiful look to the dinner table or you can keep in over the window or keep it over the fireplace. Christmas has arrived during the winter and when you will see the outside. You can see lots of snow on the street and tree. So if you are a fan of winter then you will definitely love to have that winter touch in your Christmas decoration. This stunning winter wonderland decoration will give an awesome look to the dinner table for your guest. You will definitely love the idea shown in the below picture. We all love to write the beautiful quotes or messages for the Christmas. Peoples use them as a sign board or display them in so many different ways. So if you want to give a beautiful and meaningful look the Christmas decoration this year. Then you can write a quote on the sheet and keep it along with the decoration. You can copy the same quote shown in the picture, choose the color of a sheet as per the decoration theme. There are so many types of ornaments which we use for the Christmas decoration, especially for the Christmas tree decoration. But have ever make a decoration using the only ornament? Give a try to this beautiful ornaments Christmas decoration on the wall. You can make this decoration on the living room wall or bedroom wall, the choice is yours. Every home has some empty jars and they are the most useful things for the Christmas decoration. You can make so many types of different things for the Christmas decoration using jars. As you know that candles always a very important role in the decoration and they are the main source of the lights. So you must need a have a beautiful candles holder. Give a try to this beautiful red mason jar Christmas candle decoration and it will give a perfect display to your decoration. Every home has a mantel in the living room and this is a main source heat during the Christmas. Most of the time dinner table is near to mantel, so why not do the stunning mantel Christmas decoration. make some different color stocking and hang them on the mantel. You can make a small wreath along with lights and hang it on the wall over the mantel. Keep some other decoration around the mantel to get a perfect display. When peoples thinking about the Christmas decoration the first thing comes in the mind that which theme they are going to choose. So if you are thinking to decorate your home in a vintage and traditional way then you can give a try to this gold Christmas decoration. 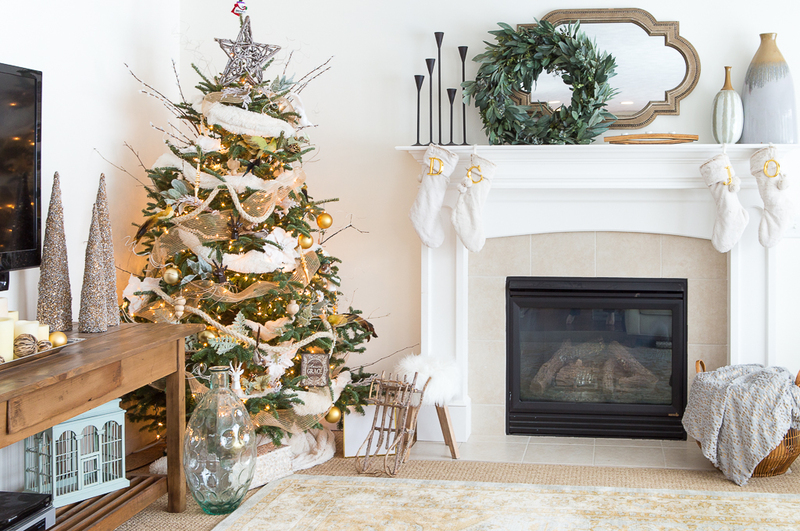 Decorate the mantel, your Christmas tree and other places in the golden color to get a stunning look. The apothecary jars always have the enough space, you give try more creativity with these jars. Make a small Christmas village inside the jar using white sand and small Christmas tree. Keep tow big candles in around the jars using Apothecary candle holders. You can keep this decoration on the dinner table or over the fireplace for a beautiful Christmas decoration display.